GORGEOUS! 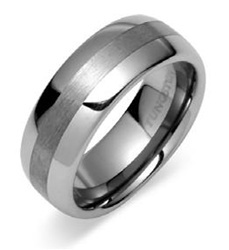 This tungsten carbide wedding band has a simple brush that gives it the appearance of an inlay. The reason it's better to do this inlay over using another precious metal is because other metals will scratch. This mens wedding ring will look the same as the day you ordered it for the rest of your life! This tungsten carbide ring comes with comfort fit and is 8mm in width. Ships in 24-48 hours.